French senators on Wednesday grilled President Emmanuel Macron's disgraced former security aide Alexandre Benalla over an assault scandal that tarnished Emmanuel Macron's reputation. Alexandre Benalla made global headlines in July after Le Monde newspaper revealed him as the man filmed roughing up demonstrators at a May Day rally in Paris, apparently posing as a police officer with a police helmet and armband. The 27-year-old, who was a security official in the presidency and often seen by Macron's side, said he was attending the demonstration as an observer and stepped in to help police bring the protests under control. The footage of him hitting a young man and forcibly removing a young woman from the demonstration caused widespread shock, which was compounded when it was revealed that Macron had known about the incident and did not report Benalla to the authorities. He is seen, wearing a helmet and unceremoniously grabbing the young woman and hitting her companion on the chest and head. The two people filmed being accosted by Benalla, were questioned at length by investigating judges in Paris court for the first time on Wednesday. They admitted hurling projectiles on the day in question but denied being part of a militant group, according to their lawyer. Macron, who had campaigned on a promise to clean up French politics, dismissed the scandal as a "storm in a teacup". But while his government survived two no-confidence votes, the affair was nonetheless seen as a blight on the record of the centrist and led to calls for greater checks on his powers. 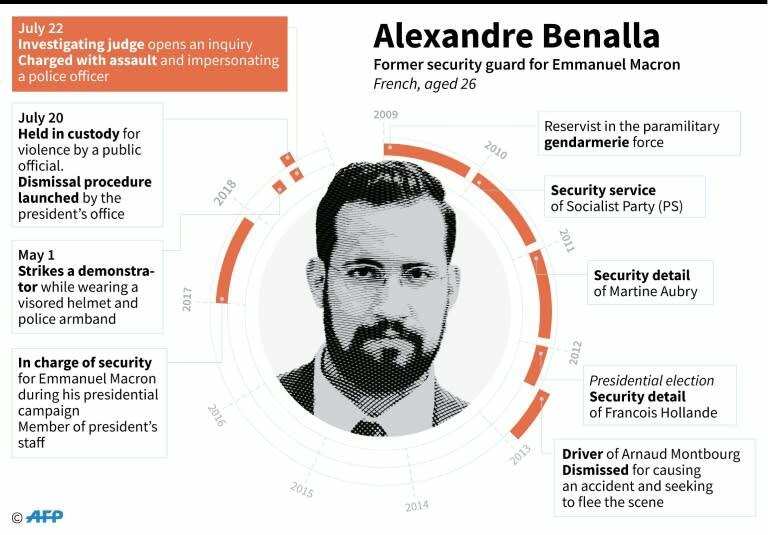 Benalla, a former bouncer who has been charged with assault and impersonating a police officer, was head of Macron's security team during the 2017 campaign and followed him to the Elysee Palace after his win. Both during and after the campaign he was seen flanking Macron during public outings, but on Wednesday he denied that he had ever acted as his bodyguard -- a job reserved for elite members of the gendarmerie which comes under the interior ministry. "I was never a police officer nor the president's bodyguard," said Benalla, who wore a suit and tie and chose his words with care, adding that his role was more like that of "a director or conductor". Members of the Senate committee investigating the scandal dubbed "Benallagate" did not quiz him about the assault. Their two and a half hours of questioning focused mainly on whether the presidency encroached on the role of the government, which is officially separate from the presidency, by giving him extraordinary powers. Benalla, a fan of the film "In the Line of Fire" about a US secret service agent trying to thwart a presidential assassination plot, admitted he carried a Glock 43 handgun during some outings with Macron. "I would arrive in the morning with the gun on my belt and leave in the evening with the gun on my belt," he said, while insisting he bore arms for his "personal security". He also admitted to securing an exclusive badge granting him access to the National Assembly on a "personal whim", so he could use parliament's gym and library. Macron's approval ratings took a tumble over "Benallagate" and have continued to fall since, dragged down by disappointing growth and jobs data and a perception that his policies are tilted towards the rich. A Kantar Sofres poll published Monday showed only 19 percent of the French satisfied with his performance. His refusal to answer questions about the Benalla scandal for several days after it broke prompted critics to accuse him of authoritarianism and arrogance. 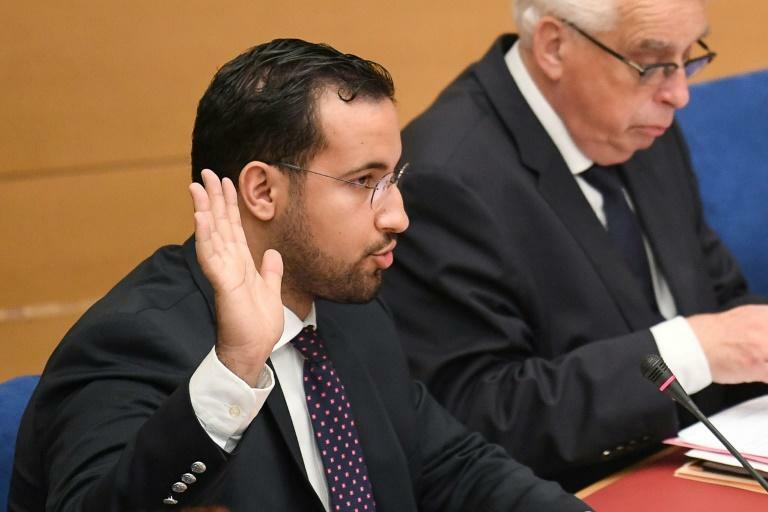 Addressing members of his Republic on the Move (LREM) party at the height of the affair, he accused Benalla of "betrayal" and said he took full responsibility for the affair. "Let them come and get me," Macron said, despite the fact that French presidents are immune from prosecution. LREM lawmakers boycotted Wednesday's Senate hearing, accusing the opposition-dominated upper house of parliament of mounting a deliberate ploy to get at the president.